32 FR 4001; March 11, 1967. Known to reach 180 - 220 mm total length. Has iridescent gold sides, blending to a darker shade of copper. Spots are small and profuse and confined to an area above lateral line extending onto the head, dorsal and caudal fins. 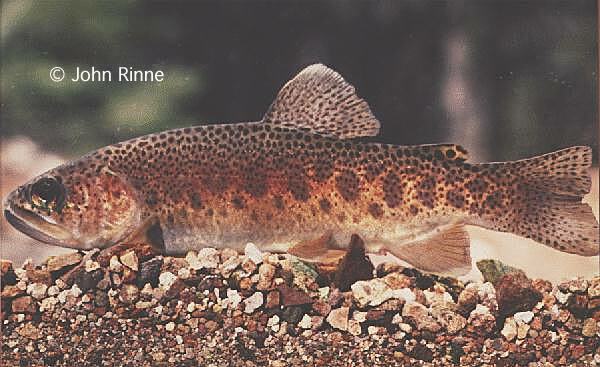 Whitish to yellowish tipped fins, salmon-pink band, and yellow "cutthroat" mark. U.S.A. (AZ, NM). Endemic to the Mogollon Plateau of NM and AZ. Native populations are confined to 5 streams in NM. In Gila Natl Forest: Iron, McKenna, & Spruce Creeks in Gila Wilderness along with Main & South Diamond Creeks in Aldo Leopold Wilderness. Inhabit clear runs in small mountain headwater streams that are typically narrow and shallow. Also inhabit pools with sufficient depth and cover to provide resting and hiding places during flood and drought periods. 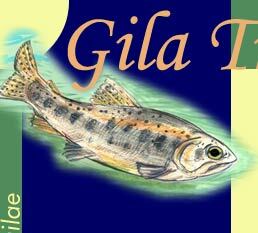 The critical thermal maxima for Gila Trout is 28.25 - 25.57 degrees Celsius. Use(d) beaver ponds with downed debris for reproductive habitat and nest/nursery locations. Spawning season in these streams begins in early April and continued until late May to mid June (depending on water temperatures). Fecundity: ranges from 96 - 196 eggs. The maximum fecundity can be up to 686 eggs! Young emerge at 15 to 20 mm after an incubation of 8 to 10 weeks. Aquatic invertebrates. Opportunistic feeders that utilize larval and adult unsects and small fishes. Hybridization with non-native salmonoids, heavy fishing pressure, and changes in stream conditions. Livestock grazing, elimination of Beaver in riverine ecosystems, and fire supression. Family: Salmonidae. SWCBD submitted petition for extensive watershed based critical habitat. Petition rejected by USFWS.